pGB expression vectors contain the human U6 RNA polymerase III promoter, which directs constitutive, high-level expression of short RNA transcripts in many cells. Each vector also contains the neomycin/kanamycin-resistance gene to provide kanamycin resistance in bacteria and the G418 resistance in mammalian cells. 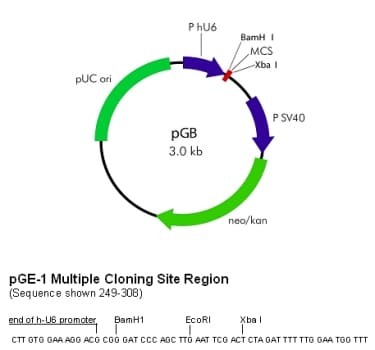 The pGB Negative Control vector contains a insert that does not have significant homology to mammalian genes expressed in human, mouse, and rat, and it can be used as a negative control for pGB-Caspase siRNA vectors. This siRNA negative control vector is used as a negative control for siRNA expression. The pGB siRNA vectors can be transfected into mammalian cells using Lipofectamine (Invitrogen). For transient transfection, cells can be analyzed in 24-96 hours following transfections, by Western blot analysis or other detection means. For stable transfections, cells can be selected in G418 selection medium to obtain stable cell lines with the specific gene blocked. Small interfering RNAs (siRNAs) are short, double-stranded RNA molecules that can target and degrade specific complementary mRNAs. The target gene-specific degradation is an effective means of gene suppression. Abcam's pGB siRNA vectors are designed to provide efficient, long-term suppression of a target gene in cultured mammalian cells and in vivo. The pGB vectors have been optimized for suppressing expression of target genes in mammalian cells by using the human U6 promotor (a RNA polymerase III promotor) which generates large amounts of siRNA in mammalian cells. The pGB expression vector also provides neomycin resistance marker for the selection of stable cell lines, permitting long-term suppression of the target gene. Validation: The antibodies listed as related products have not been previously used by Abcam to validate this vector. The siRNA vectors have been tested in HeLa and/or 293 cell lines. The siRNA-mediated knockdown was analyzed by Western blot. 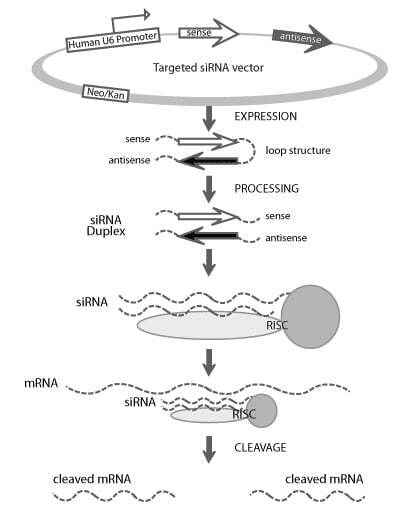 Once processed, the vector expressed siRNA is incorporated into a multi-protein nuclease complex known as the RNA-induced silencing complex (RISC). Homology between the sense portion of the siRNA sequence and the mRNA enables the nuclease enzyme to bind and cleave the caspase transcript into small pieces, which are degraded by the cell's machinery. ab12505 has not yet been referenced specifically in any publications. Publishing research using ab12505? Please let us know so that we can cite the reference in this datasheet. There are currently no Questions for ab12505.